Name Variation Marit Pedersdater Mogstad was also known as Mary. Name Variation Marit Pedersdater Mogstad was also known as Marie. Married Name 16 June 1876 As of 16 June 1876,her married name was Sogge. Married Name 16 June 1876 As of 16 June 1876,her married name was Romundstad. Marit Pedersdater Mogstad was born on 13 February 1851 at Norway. She was the daughter of Peter Erickson and Brynhild Knutsdotter. Marit Pedersdater Mogstad married Ola Johnson Romundstad on 16 June 1876. Marit Pedersdater Mogstad died after 1905 at Sioux City, Iowa. 1905 Woodbury, Iowa She appeared on the census of 1905 at Woodbury, Iowa, listed as widowed. Marit Pedersdater Mogstad immigrated in 1894. She had 8 with 6 living in 1900 children. [S245] U.S. Federal Census 1900 U.S. Federal Census, by Ancestry.com, Year: 1900; Census Place: Sioux City, Woodbury, Iowa; Roll: 467; Page: 10A; Enumeration District: 0168; FHL microfilm: 1240467. Peter Erickson was born in 1823. He married Brynhild Knutsdotter on 20 May 1852. Married Name 20 May 1852 As of 20 May 1852,her married name was Erickson. Brynhild Knutsdotter was born in 1830. She married Peter Erickson on 20 May 1852. Fred Kruse was born circa 1893 at Wisconsin. He was the son of John August Kruse and Martha Stronski. [S244] U.S. Federal Census 1910 U.S. Federal Census, by Ancestry.com, Year: 1910; Census Place: North Crandon, Forest, Wisconsin; Roll: T624_1710; Page: 5B; Enumeration District: 0026; FHL microfilm: 1375723. Jacob Bell married Martha Hay Taliaferro, daughter of Captain John Taliaferro and Ann Stockdell, on 4 January 1808 Isham Tatum preacher. Jacob Bell died before 1850. Married Name 4 January 1808 As of 4 January 1808,her married name was Bell. Martha Hay Taliaferro was born on 22 January 1789 at Madison, Virginia. She was the daughter of Captain John Taliaferro and Ann Stockdell. Martha Hay Taliaferro married Jacob Bell on 4 January 1808 Isham Tatum preacher. Martha Hay Taliaferro died on 2 March 1854 at died at residence of her son-in-law, John Griffin, Graves, Kentucky, at age 65. [S249] U.S. Federal Census 1850 U.S. Federal Census, by Ancestry.com, Year: 1850; Census Place: District 2, Graves, Kentucky; Roll: M432_201; Page: 380A; Image: 358. Wallace J. Wedig was born on 27 June 1924 at Wisconsin. He was the son of Leo J. Wedig and Gertrude Leary. Wallace J. Wedig died on 21 April 1995 at Platteville, Grant, Wisconsin, at age 70 Wallace J Wedig obituary. Name Variation Gerald H. Van De Wiel was also known as VanDeWiel. Name Variation Gerald H. Van De Wiel was also known as Jerry. Gerald H. Van De Wiel was born on 30 January 1919. He married Elizabeth Rose Kieler, daughter of George Raymond Kieler and Maria Magdalena Kunkel, on 14 May 1940. Gerald H. Van De Wiel died on 9 July 1991 at Grant, Wisconsin, at age 72. Married Name 21 April 1936 As of 21 April 1936,her married name was Wiederholt. Irma Dalsing was born on 26 September 1914. She was the daughter of Andrew Edward Dalsing and Louisa Mary Franzen. Irma Dalsing married Joseph Walter Wiederholt, son of John B. Wiederholt and Elizabeth M. Weber, on 21 April 1936. Irma Dalsing died on 10 August 2009 at age 94 Irma Wiederholt, 94, of Dickeyville, died Monday, Aug. 10, 2009, at Southwest Health Center, Platteville. Services will be at 10:30 a.m. Thursday, Aug. 13, at Holy Ghost Catholic Church, Dickeyville, with the Rev. Bernard Rott officiating. Burial will be in the church cemetery. 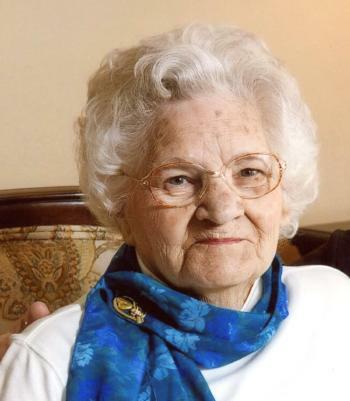 Friends may call from 4 to 8 p.m. Wednesday, Aug. 12, at Casey Funeral Home and Cremation Service, Cuba City, where there will be a parish wake service at 4 p.m. She was born on Sept. 26, 1914, in Jamestown Township, daughter of Andrew and Louise (Franzen) Dalsing. She married Joseph Wiederholt on April 21, 1936; he preceded her in death on April 8, 1994. They farmed near Louisburg until 1968. Irma enjoyed quilting, and her family was so important to her. Surviving are three daughters, Alvara (Vi) Kirchen Francis, of Dubuque, Eileen Dunne and Mary (Greg) Brandt, both of Cuba City; three sons, Harold (Kay) Wiederholt, of Lancaster, LaVern (Ruth) Wiederholt and Eldon (Judy) Wiederholt, both of Cuba City; a daughter-in-law, Donna Wiederholt, of Shullsburg; two sisters, Bernadine Schaefer, of Cuba City, and Agnes (Lowell) Kahle, of Hazel Green; a sister-in-law, Elizabeth Dalsing, of Dubuque; a brother-in-law, Donald Brandt, of Hazel Green; 21 grandchildren; 37 great-grandchildren; a great-great-grandchild; five stepgrandchildren; 14 stepgreat-grandchildren; and a stepgreat-great-grandchild. She also was preceded in death by her parents; a son, Herbert; a daughter, Janet; three sons-in-law, Charles Dunne, Ralph Kirchen and Robert Francis; a brother, Delmar Dalsing; four sisters, Delores Brandt, Myrtle Weber, Almira Weber and Marie Bechen; and four brothers-in-law, Art Weber, Harold Weber, Elmer Schaefer and Merlin Bechen. Joseph Walter Wiederholt was born on 13 May 1907 at Grant, Wisconsin. He was the son of John B. Wiederholt and Elizabeth M. Weber. Joseph Walter Wiederholt married Irma Dalsing, daughter of Andrew Edward Dalsing and Louisa Mary Franzen, on 21 April 1936. Joseph Walter Wiederholt died on 8 April 1994 at Grant, Wisconsin, at age 86 Joseph W. Wiederholt, 86, of Dickeyville, Wisconsin, died Friday afternoon, April 8, 1994, at Orchard Manor Nursing Home in Lancaster, Wisconsin. Joseph Walter Wiederholt was born on May 13, 1907 in Louisburg, Wisconsin to John and Elizabeth (Weber) Wiederholt. Joseph married Irma C. Dalsing on April 21, 1936 in Immaculate Conception Catholic Church in Kieler, Wisconsin. Family and friends called from 2 to 8 p.m., Sunday, April 10, at Casey Funeral Home in Cuba City, Wisconsin, where there was a parish wake service at 4:30 p.m. Funeral services were held at 10:30 a.m., Monday, April 11, at Holy Ghost Catholic Church in Dickeyville, and burial was in the church cemetery. Survivors are his wife, Irma, of Dickeyville, Wis; three daughters, Alvara (Ralph) Kirchen of Dubuque, Ia., and Eileen (Charles) Dunne and Mary (Greg) Brandt, both of Cuba City, Wis; four sons, Herbert (Jean) Wiederholt, LaVern (Ruth) Wiederholt, and Eldon (Judy) Wiederholt, all of Cuba City, Wis., and Harold (Kay) Wiederholt, of Lancaster, Wis; 21 grandchildren and 15 great-grandchildren; two sisters, Mary Timmerman, of Dickeyville, Wis., and Alice Timmerman, of Louis-burg, Wis; and a brother, Louis Wiederholt, of St. Donatus, Iowa. He was preceded in death by a daughter, Janet, in 1953. Married Name 19 February 1955 As of 19 February 1955,her married name was Loeffelholz. Pearl L. Culbertson was born on 8 December 1919. She married Vincent J. Loeffelholz, son of George Loeffelholz and Matilda Kirchberg, on 19 February 1955. Pearl L. Culbertson died on 18 March 1994 at age 74. Thomas Wedig was the son of Leo J. Wedig and Gertrude Leary. Eldon Schardt was the son of Lawrence Schardt and Margaret C. Helbing. Eldon Schardt died before 2014. David Van De Wiel was the son of Gerald H. Van De Wiel and Elizabeth Rose Kieler. David Van De Wiel died on 3 April 1982. John Leo Wedig was born on 9 August 1949 at Wisconsin. He was the son of Wallace J. Wedig. John Leo Wedig died on 19 July 1982 at Illinois at age 32. Name Variation Henry A. Melssen was also known as Hank. Henry A. Melssen was born on 4 February 1914 at Dickeyville, Grant, Wisconsin. He was the son of Leo Melssen and Barbara Riemenapp. Henry A. Melssen died on 24 October 2008 at age 94 DICKEYVILLE, Wis. - Henry A. "Hank" Melssen , 94, of Dickeyville, died Friday, Oct. 24, 2008, following a short illness. Services will be at 10:30 a.m. Wednesday, Oct. 29, at Holy Ghost Catholic Church, Dickeyville. Burial will be in the church cemetery, where military rites will be accorded. Friends may call from 3 to 8 p.m. today at Haudenshield Funeral Home & Cremation Service, Cuba City, where the parish rosary will be recited at 3 p.m. He was born on Feb. 4, 1914, in Dickeyville, son of Leo and Barbara (Riemenapp) Melssen . He was drafted into the Army in 1941 and served until 1945 as a member of the 904th Field Artillery. He married Mary Ann Kieler on June 9, 1948, at Immaculate Conception Catholic Church in Kieler. Hank was a founding member of the Dickeyville Fire Department and the Dickeyville Rescue Squad. He was Dickeyville's first fire chief and served for 17 years. He retired following 50 active years and then became a social member. He was the treasurer for the Dickeyville Telephone Co. for 45 years and a member of the Catholic Order of Men's Foresters. Hank was a blacksmith and mechanic for 50 years and ran Melssen 's Garage. He and his wife ran "Hank's Bar" in Dickeyville for many years. Surviving are his wife, Mary Ann (Kieler) Melssen ; eight children, Gerald (Sandy) Melssen , of Epworth, Iowa, Mary Jo (Ronnie) Lau, of Dickeyville, Doris (Harold) Kelly, of Dubuque, Donald Melssen , of Phoenix, David (Rita) Melssen , of Dickeyville, Lee Ann Melssen and Linda (Charlie) Morshead, both of Polk City, Iowa, and Henry John (Maria) Melssen , of Dickeyville; 17 grandchildren; nine great-grandchildren; five stepgrandchildren; and six stepgreat-grandchildren; a brother, John (Mary Anne) Melssen , of Dickeyville; and a sister, Lucida Schmit, of Dubuque. He was preceded in death by his parents, Leo Anton and Barbara (Riemenapp) Melssen ; his brothers, Emil, Harold and Robert; and his sisters, Catherine Reisch and Florida (Fritz) Reuter. Name Variation James Kieler was also known as Jimmy. James Kieler was the son of Charles Henry Kieler and Josephine Ann Kunkel. James Kieler died before 1997. James Kieler was living in 1986. Married Name 17 June 1947 As of 17 June 1947,her married name was Kieler. Frances Evelyn Leibfried was born on 20 April 1927 at Tennyson, Grant, Wisconsin. She was the daughter of John Bernard Leibfried and Roselinda Catherine Hufnagel. 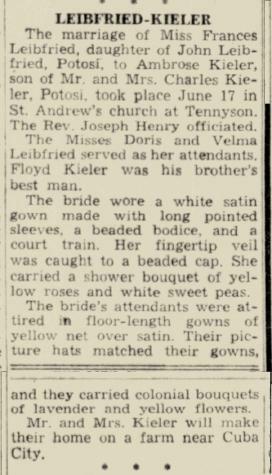 Frances Evelyn Leibfried was the maid of honor at the wedding of Robert Ehlers and Inez Hildegard Leibfried in January 1943; Inez Liebfried and Robert Ehlers marriage announcement. Frances Evelyn Leibfried married Ambrose M. Kieler, son of Charles Henry Kieler and Josephine Ann Kunkel, on 17 June 1947 Ambrose Kieler and Frances Leibfried marriage announcement. Frances Evelyn Leibfried died on 21 February 2015 at age 87 CUBA CITY, Wis. - Frances Evelyn Kieler , 87, of Cuba City, Wisconsin, passed away on Tuesday, February 17, 2015, at Epione Pavilion in Cuba City, surrounded by her loving family. The Mass of Christian Burial will be 10:30 a.m. Saturday, February 21, 2015, at St. Rose of Lima Catholic Church in Cuba City with Rev. David Flanagan officiating. Her final resting place will be in the church cemetery. Friends may call from 3 to 8 p.m. Friday at Casey Funeral Home & Cremation Services in Cuba City, where the parish wake service will be at 2:45 p.m. Friends may also call from 9 to 9:45 a.m. Saturday at the funeral home before the service. Frances was born on April 20, 1927, in Tennyson, Wisconsin, the daughter of John and Rose (Hufnagel) Leibfried. 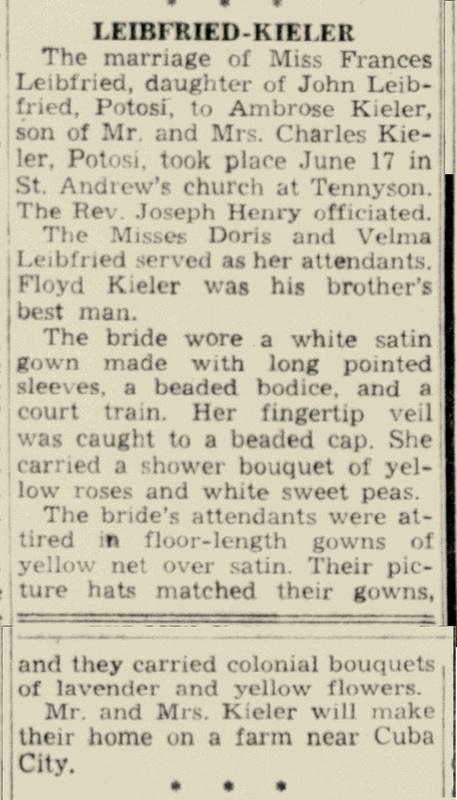 On June 17, 1947, Frances married Ambrose Kieler at St. Andrew Church in Tennyson. Together they farmed in rural Cuba City where they were members of St. Rose of Lima Catholic Church. Frances was formerly a member of the St. Rose Altar Society. She enjoyed spending time with her family, especially her children and grandchildren, gardening, praying the rosary, volunteering at the Cuba City Meal Site and playing bingo with the residents at the nursing home. She greatly enjoyed playing games and cards with her grandchildren and putting puzzles together. Frances played canasta with a special group of ladies in her neighborhood. Frances' family would especially like to thank the staff at Epione Pavilion, Dr. White and Dr. Tinsman, for their kind and compassionate care of their mother for the last five and a half years. Frances was dearly loved by the nursing home staff and all who met her. She was a beloved mother, grandmother and friend, and she will be greatly missed. Frances is survived by three sons, Ronald Kieler , Randy (Donna) Kieler and Terry (Kim) Kieler , all of Cuba City; five daughters, Jane O'Brien, of Montfort, Judy (Steve) Cushman, of Cassville, Mary Kay (Dean) Booth, of Cuba City, Ruth (Steve) Crubaugh, of Waupun, and Cindy (Tim) Morrissey, of Cuba City; 23 grandchildren; 27 great-grandchildren; and a sister, Ann (Mark) Langkamp, of Indiana. Frances will now be reunited with her husband, Ambrose; a son, Samuel; an infant daughter, Rose Ann; a son-in-law, John O'Brien; a great-granddaughter, Lauren White; her parents, John and Rose; three brothers, James, Louis and Bernard Leibfried; and four sisters, Mary Elskamp, Inez Ehlers, Velma Kruser and Doris Runde. Samuel J. Kieler was born on 8 August 1962 at Cuba City, Grant, Wisconsin. He was the son of Ambrose M. Kieler and Frances Evelyn Leibfried. Samuel J. Kieler died on 18 June 2004 at age 41 CUBA CITY, Wis. - Samuel J. Kieler , 41, of 409 W. Clay St., Cuba City, died Friday, June 18, 2004, at Heartland Healthcare Center, Platteville. Services will be at 10:30 a.m. Tuesday at St. Rose of Lima Catholic Church, Cuba City, with the Rev. David Flanagan officiating. Burial will be in the church cemetery. Friends may call from 3 to 8 p.m. Monday at Casey Funeral Home, Cuba City, where there will be a parish wake service at 3 p.m.
Mr. Kieler worked as a farmhand on the family farm. He was born on Aug. 8, 1962, in Cuba City, son of Ambrose M. and Frances (Leibfried) Kieler. He enjoyed hunting, fishing, bowling, teasing his nieces and nephews and talking on the phone with his family. Surviving are his mother, Frances Kieler, of Cuba City; five sisters, Jane (John) O'Brien, of Montfort, Judy (Steven) Cushman, of Platteville, Mary Kay (Dean) Booth and Cindy (Tim) Morrissey, both of Cuba City, and Ruth (Steven) Crubaugh, of Waupun; three brothers, Ron Kieler, Randy (Donna) Kieler and Terry (Kim) Kieler, all of Cuba City; nieces and nephews; and his good friends, Jim, Todd and Billy. He was preceded in death by his father, Ambrose M. Kieler ; and an infant sister, Rose Ann. John O'Brien was born on 6 July 1949. He died on 23 January 2011 at age 61. Rose Ann Kieler was the daughter of Ambrose M. Kieler and Frances Evelyn Leibfried. Rose Ann Kieler died at died in infancy. Thomas Mercer was born on 1 January 1654 at Thorpe Mandeville, Aynho-on-the-Hill, Northampton, England. He was the son of Edward Mercer and Elizabeth Whitcher. He died on 29 April 1655 at Thorpe Mandeville, Aynho-on-the-Hill, Northampton, England, at age 1. [S410] Church of English church records parish registers, by Ancestry.com, Thorpe Mandeville Parish Registers 1559-1720. Edward Killingbeck was born in 1605 at Twineham, Sussex, England. He witnessed the baptism of Humphrey Killingbeck on 31 January 1631 at Bolney, Sussex, England. 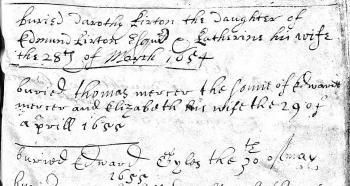 Edward Killingbeck witnessed the christening of Ann Killingbeck on 27 December 1638 at Twineham, Sussex, England; Father: Edward Killingbeck. 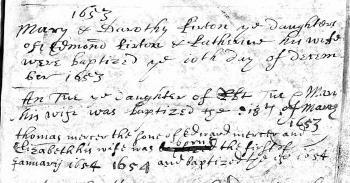 Edward Killingbeck witnessed the christening of Jane Killingbeck on 19 September 1641 at Twineham, Sussex, England. Edward Killingbeck died before October 1642 at Sussex, England. Mary Amelia Ingalls was born on 10 January 1865 at Pepin, Wisconsin. She was the daughter of Charles Phillip Ingalls and Caroline Lake Quiner. Mary Amelia Ingalls died on 17 October 1928 at Keystone, Pennington, South Dakota, at age 63. [S247] U.S. Federal Census 1870 U.S. Federal Census, by Ancestry.com, Year: 1870; Census Place: Rutland, Montgomery, Kansas; Roll: M593_439; Page: 636A; Image: 512; Family History Library Film: 545938. [S246] U.S. Federal Census 1880 U.S. Federal Census, by Ancestry.com, Year: 1880; Census Place: De Smet, Kingsbury, Dakota Territory; Roll: 113; Family History Film: 1254113; Page: 146A; Enumeration District: 087; Image: 0007. [S245] U.S. Federal Census 1900 U.S. Federal Census, by Ancestry.com, Year: 1900; Census Place: De Smet, Kingsbury, South Dakota; Roll: 1550; Page: 8A; Enumeration District: 0206; FHL microfilm: 1241550. Rose Wilder was born on 5 December 1886 at DeSmet, Kingsbury, South Dakota. She was the daughter of Almanzo James Wilder and Laura Elizabeth Ingalls. Rose Wilder died on 30 October 1968 at Danbury, Fairfield, Connecticut, at age 81. [S245] U.S. Federal Census 1900 U.S. Federal Census, by Ancestry.com, Year: 1900; Census Place: Pleasant Valley, Wright, Missouri; Roll: 908; Page: 2A; Enumeration District: 0152; FHL microfilm: 1240908. [S244] U.S. Federal Census 1910 U.S. Federal Census, by Ancestry.com, Year: 1910; Census Place: Mansfield Ward 1, Wright, Missouri; Roll: T624_828; Page: 1B; Enumeration District: 0142; FHL microfilm: 1374841. Name Variation Caroline Celeste Ingalls was also known as Carrie. Married Name 1912 As of 1912,her married name was Swanzey. Caroline Celeste Ingalls was born on 3 August 1870 at Rutland, Montgomery, Kansas. Caroline Celeste Ingalls married David Nevin Swanzey in 1912. Caroline Celeste Ingalls died on 2 June 1946 at Rapid City, Pennington, South Dakota, at age 75. Married Name 1901 As of 1901,her married name was Dow. Grace Pearl Ingalls was born on 23 May 1877 at Burr Oak, Mitchell, Iowa. Grace Pearl Ingalls married Nathan William Dow in 1901. Grace Pearl Ingalls died on 10 November 1941 at Kingsbury, South Dakota, at age 64. Lansford Whiting Ingalls married Laura Louise Colby, daughter of (?) Colby. Lansford Whiting Ingalls was born on 12 November 1812 at Dunham, Missisquoi, Quebec, Canada. He was the son of Samuel Ingalls and Margaret Delano. Lansford Whiting Ingalls died on 21 May 1896 at Webster, Burhett, Wisconsin, at age 83. Married Name 2 April 1831 As of 2 April 1831,her married name was Quiner. Married Name 1849 As of 1849,her married name was Holbrook. Charlotte Wallis Tucker was born on 25 May 1809. She married Henry Newton Quiner on 2 April 1831 at Boston, Suffolk, Massachusetts. Charlotte Wallis Tucker married Frederick Holbrook in 1849. Charlotte Wallis Tucker died on 20 September 1884 at Rome, Jefferson, Wisconsin, at age 75. Frederick Holbrook married Charlotte Wallis Tucker in 1849.